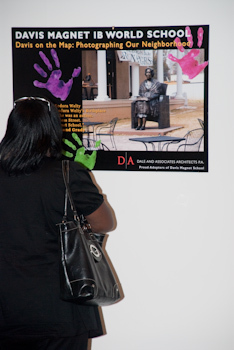 Two exhibits of student artwork fill the second floor of the Mississippi Arts Center. Twenty-one of Jackson’s public schools participated this year in JumpstART, a project of the Ask for More Arts Collaborative. Friday night marked the opening of the JumpstART exhibit and Sunday marks the opening of the accompanying exhibit, the Power APAC annual student art show. JumpstART participants were in kindergarten through fifth grades; the Power APAC students were fourth through twelfth. All the Campbells went because I was an artist-in-residence at Davis Magnet IB World School this spring (one of my students took the photo in the display panel above) and because my two younger sons, N and D, are fifth and sixth graders respectively in the APAC visual arts program. The oldest, G, is in the music program, but he attended so he could write about the exhibit as a class requirement. Richard took photographs that will go in the newsletter for the JumpstART convening partner, Parents for Public Schools of Greater Jackson. 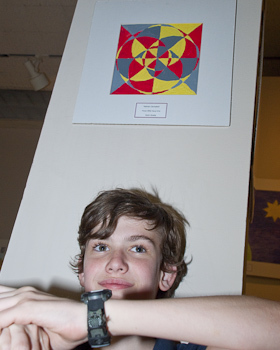 Here is my sixth grader with one of his pieces. I thought this was cool when I first saw it in the classroom; I love geometric shapes and I love the colors, too. It reminds me of a kaliedocycle he brought home a few weeks ago. He had made it in his gifted class. It is a very cool three-dimensional turning paper toy that he colored with markers. Very exciting. Here are some instructions to make your own. 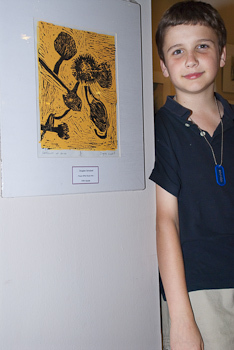 Here’s my fifth grader with one of his prints. He did a few prints of sunflowers and some were plain ink and others were crayon resist. Very nice. I always enjoy these end-of-year exhibits because I don’t get to see their work along the way — unless it happens to be done before a parent/teacher conference. D was unhappy that his “best” piece wasn’t in the show. He drew and colored a poster for the Martin Luther King Day contest and it was still in the hands of the officials. I hope we’ll have it back to hang on our walls at home this summer. As I said, we are being inundated with end-of-year stuff. I spent the day in Oxford with G at the Mississippi Music Teachers’ Association State Special Recognition Recital. He had earned a place with a district performance last month. He played two pieces in a solo recital and then another in the sonatina event. At this level, all the students were very accomplished and I loved listening to the pieces. We finished there and headed over to Square Books for a book, some ice cream, and a quick meeting with the manager about planning an event around Wolfsnail: A Backyard Predator.